12276 ft (3742 m) . 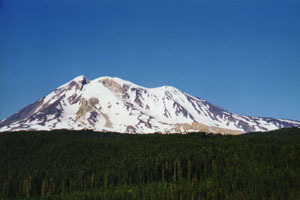 Mount Adams is the second highest peak in Washington State and the third highest in the Cascade Range. 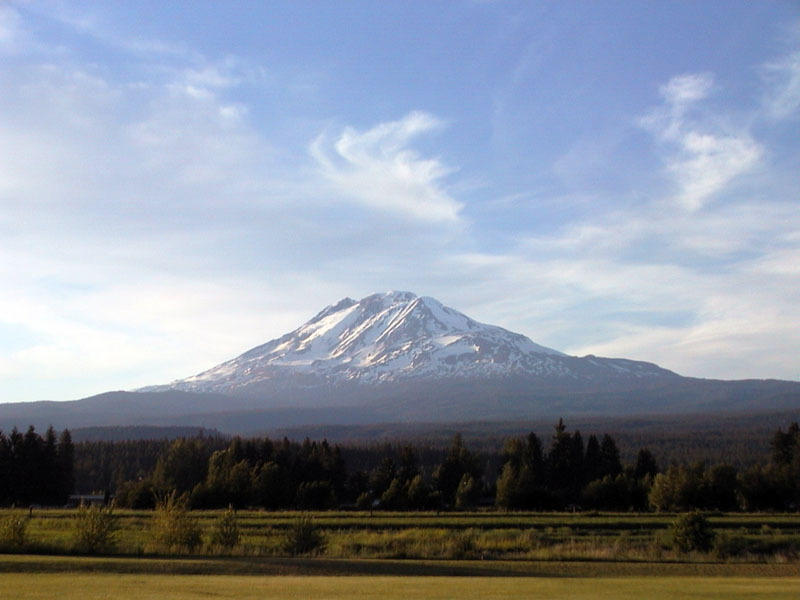 It is a broad volcanic massif which towers above the surrounding hills about 30 miles north of the Columbia River. The summit is covered by a large icecap, and over a dozen glaciers pour down its flanks, most via massive and treacherous icefalls. However, the South Rib (Suksdorf Ridge) route is crevasse-free, providing one of the easier climbing routes and nicest ski runs on any of the northern Cascade volcanoes. 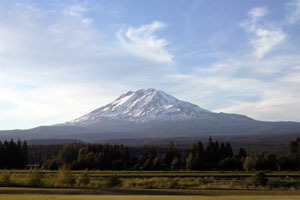 It has over 7000 ft (2100 m) of skiable vertical in the spring, including a near-perfect 30-degree pitch for over 2500 ft (800 m) below the false summit. An even better descent is the Southwest Chutes variation, which drops for over 4000 vertical feet (1200 m) from the false summit at a consistent 35-40 degree pitch. (22 km) A variation of the previous route, with even better ski terrain. The chutes drop SW from the false summit at a 35-40 degree slope for over 4000 vertical feet. Can climb either the South Rib or the chutes directly. If done after late spring, the traverse back to the climbing route from the bottom of the chutes may be snow-free. (24 km) Another (somewhat circuitous) variant of the South Rib, which avoids that route's crowds at least below the false summit (the routes merge above). Moderately crevassed, this route also a fine long, steep pitch as it drops SE from the false summit. (24 km) A moderate glacier route which avoids the crowds of the South Rib. The upper part of the White Salmon Glacier is somewhat steeper and crevassed, and exposed to rockfall from rotten cliffs nearby. However, in August 1997, a massive debris avalanche covered the lower Avalanche Glacier in 5 million cubic meters of debris, about 90% snow and ice. This was the largest avalanche in the Cascades since 1963 (not counting the landslide of Mt St Helens' 1980 eruption). 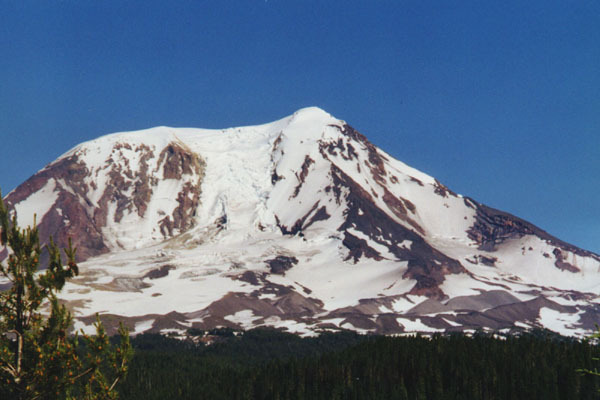 (26 km) This steep face falls from the Pinnacle (the NW summit of Adams) for nearly 3000 ft of 40-50 degree terrain. The route is snow in early season, but hard neve and ice later on, making it unpleasant and risky for skiing, although it is a decent intermediate-level alpine ice climb. No crevasse hazard on the face, but the lower part of the route joins the heavily-crevassed Adams Glacier. 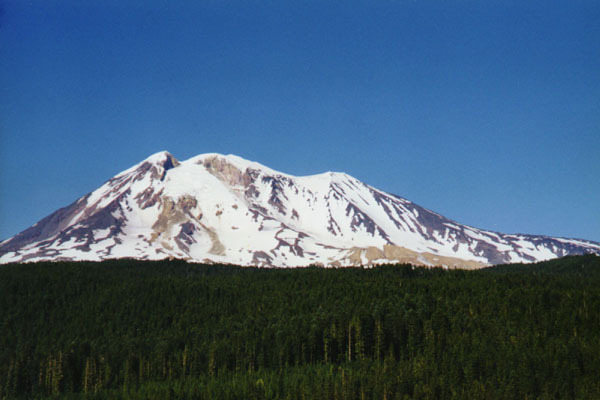 (27 km) This is the second most popular climbing route on Adams, and the first ascent route in 1854. Mostly moderate and easy terrain when snow-covered, although there are a couple of narrow and exposed sections above 9000 ft. This route is a notoriously unpleasant scramble on the descent after the snow is gone, but that shouldn't be a problem on a spring ski trip. (29 km) This steep route reaches 45-degrees on the upper part of the headwall. Not sure if anyone skis it, but in the photo on page 62 of the Cascade Alpine Guide it looks like a fine steep skiing route. Early season and a deep snowpack would be required to avoid hard neve (on the glacier headwall) or rocky sections (on the ridge). (22 km) A very gentle low elevation route which follows the massive 4-mile long lava flow of the Aiken Lava Bed. The Gotchen Glacier is a small cirque glacier fairly low on the SE flank near the South Butte. This route is also an alternative early season access to the South Rib, since the Smith Butte snow park at 3800 ft is plowed out while the road to the South Climb may be blocked by snow as low as 3000 ft.
(10 km) The Crescent Glacier is another small cirque glacier filling a basin low on the mountain. The South Rib route goes past the western edge, so this makes a good alternative if poor weather prevents an ascent to the summit. There are numerous short but steep pitches around the cirque. Full page descriptions and photos of South Rib, SW Chutes, and North Ridge routes. (left to right) the Pinnacle, the true summit, and at right the false summit. The Southwest Chutes angle down and right from the false summit. The White Salmon glacier drops from the gap to right of the Pinnacle.